A bee sting can cause excruciating pain and discomfort. There have been numerous cases in which the affected people have had severe allergic reactions to the stings of certain insects. Such cases might require urgent medical attention in order to counter the allergens. A bee normally stings a person when it feels that such a person might cause damage to the honeycomb. 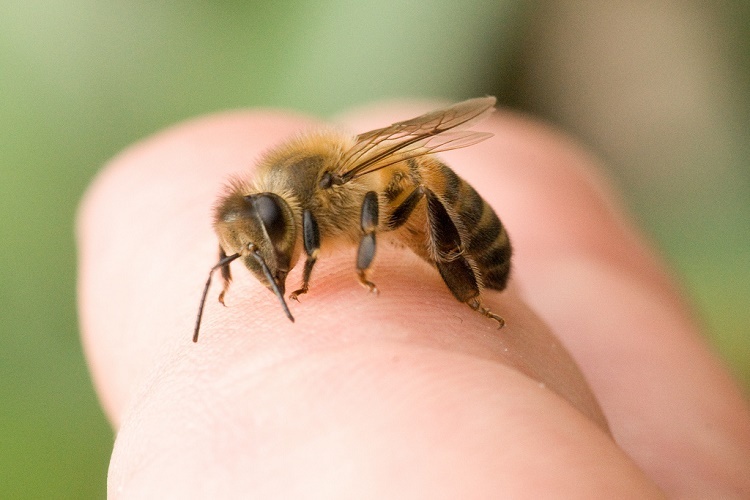 Bees also sting people if they are walked over or if they are handled roughly for any reason. There are several kinds of bees in the world and all of them have different kinds of stings. Therefore, the symptoms of a bee sting might differ vastly from person to person. However, the most common reactions will include localized swelling, severe redness and acute pain. It is extremely important to rub your fingernail or any similar object against the area which has been stung. This is done so as to remove the stinger of the bee from the skin. Once the stinger has been removed, the area can be treated with the help of medicine. Most cases of bee sting can be treated with the help of home remedies. However, if the symptoms refuse to subside, you must seek medical help immediately in order to avoid complications. This is one of the most commonly used treatments when it comes to dealing with bee stings. After the stinger has been removed, a layer of toothpaste can be applied to the area. This layer must be quite thick and must be left in place for a sufficient amount of time. It is very helpful in dealing with the symptoms of pain and swelling which commonly occur when a person has been stung by a bee.Toothpaste helps to neutralize the acidic environment created by the stinger. In most cases toothpaste helps to get rid of the problem completely and the patient experiences relief. After the symptoms subside, the area can be washed with cold water. Lavender is a very beneficial remedy when it comes to the treatment of bee stings. This is because it has a very soothing effect on the inflamed area of the skin. It is excellent for the treatment of any kind of inflammation and thus it proves to be very beneficial in the treatment of this condition. Lavender oil is a convenient way of using this herb. The pure oil of this herb must be applied to the affected area. It is advisable to refrain from massaging the area as this could aggravate the inflamed area and cause pain. Onions are very effective in the treatment of bee stings. This is because they help the body to cope with the trauma of the bee sting. After the stinger has been removed, some onion juice can be applied to the area with the help of a cotton ball. You could also make use of a fresh slice of onion by rubbing it over the area which has been stung by the bee. The ingredients which are present in an onion help to neutralize the substances which have been secreted into the body due to the bee sting.